2013, Morocco | "It's Only Nuts & Bolts"
It is now less than a week before my first overland trip to Morocco and it is probably fair to say I’m not ready. With work being so crazy since Christmas I am way behind where I would like to be but getting there slowly. On the upside, the Land Rover has been serviced by the great guys at Berkshire Land Rover in Maidenhead. All the boxes are in and the top box has been fitted for extra storage. On my previous trips I have travelled alone, this time my father is with me so additional space is needed. Just need to pack everything and fill the jerry cans so I have extra fuel. All paperwork is done, with the exception of insurance for Morocco itself, but this can be purchased at the boarder if necessary. Ferry booked. Spares need to be purchased but hopefully that wont be a problem; shouldn’t really need much; hopefully not famous last words!! So there we are, possibly not as bad as I thought. The ferry is booked for next Friday. 17:30 from Portsmouth to Santander and then after the 24 hour crossing a 10 hour drive to Southern Spain awaits. Hope to meet up with the rest of the group mid afternoon Sunday ready for a good nights sleep and then an early crossing into Morocco on Monday morning 1st April. So the mad week at work is over. The car was finally loaded and the drive to Portsmouth complete. Now looking forward to 24 hours doing very little while others take care of the journey to Santander. As expected the final packing and loading was all a little rushed. But the required spares were provided by Dingocroft in Downley exactly as requested and ready for collection at the time agreed. My green card for driving in Morocco arrived by special delivery as agreed with the very nice lady at Aviva and eventually everything came together. The loading done the car is fuller than it has ever been and the roof box has provided that little extra space which has made all the difference. When we arrived at the port there were already three other Land Rovers waiting in the line; and all on the same trip as us. It was a great opportunity to break the ice before the adventure really starts. Now it is time to relax, sleep, recharge batteries and look forward to the adventure ….. It is very easy to lose track of time on these journeys when you arrive and depart various locations at such unusual times. So far we have boarded a ferry at 17:00 GMT, left the ferry at about 18:00 the following day Spanish time. At some point over night both countries put there clocks forward by an hour, so when we thought we had arrived in the campsite at 13:00 it was in fact 14:00. Tomorrow we travel by ferry to Morocco. Assuming it is about 10:00 Spanish time when we arrive it will be 08:00 local time!!! Confused, oh yes. The journey down through Spain was long and tiring. Generally the weather was wet and cloudy, but then the sun would come out and the temperature rise. Apparently we can expect everything from hot sun to snow over the next 14 days which will give us plenty to think about while driving. We drove until midnight, slept in the car and then carried out; approximately 650 miles in total. On arrival at the campsite we met the leaders of the trip who provided some loading advise which has resulted in an element of repacking and reworking of various loads. Generally easily sorted so ready for the off. 12 cars in total will be leaving the campsite in convoy tomorrow at 08:00 sharp. Straight to the ferry where we have been warned to expect a wait. Apparently they have a tendency to cancel ferries at the last minute if the weather is not good. Then it is the Moroccan boarder to contend with. So fingers crossed for as few delays as possible. Technology having let me down this is the second attempt to write this section. No idea yet when it will be posted! Having spent a very wet night at the campsite in Spain, we awoke to clear blue sky. It was an early start as Mike, the expedition leader, had dictated that wheels needed to be rolling at 8am sharp.This was achieved by all allowing us to make the 20 mile trip to the port with ease. With the weather being unpredictable there was a chance that our quick crossing may be cancelled meaning our journey across the Mediterranean Sea could be extended from 30 minutes to 2 hours! Therefore it was important for us to be ready on the quay. The ferry was on time and the trip to Ceuta was without incident. Once back on land, and still in Spain, there was a short drive to the boarder. Mohamed our “fixer” sorted all the paperwork, stamps in passports and import licenses for the vehicles, then we were free to go. The boarder post was everything expected of Africa. The police, army, boarder guard, immigration, etc. are all there in their various uniforms and asking their questions. With this and the general hustle of humanity, vehicles and animals added to the general chaos. It was here that the first real incident of the trip occurred. For no apparent reason the rear windscreen on my car had shattered. As it isn’t laminated it had crazed into a million pieces, but fortunately was largely still in place. Two rolls of duck tape applied to both the inside and outside and the temporary repair was complete.Fingers crossed this will hold until home. Having completed the boarder crossing, exchanged some cash and refilled the cars we were off. 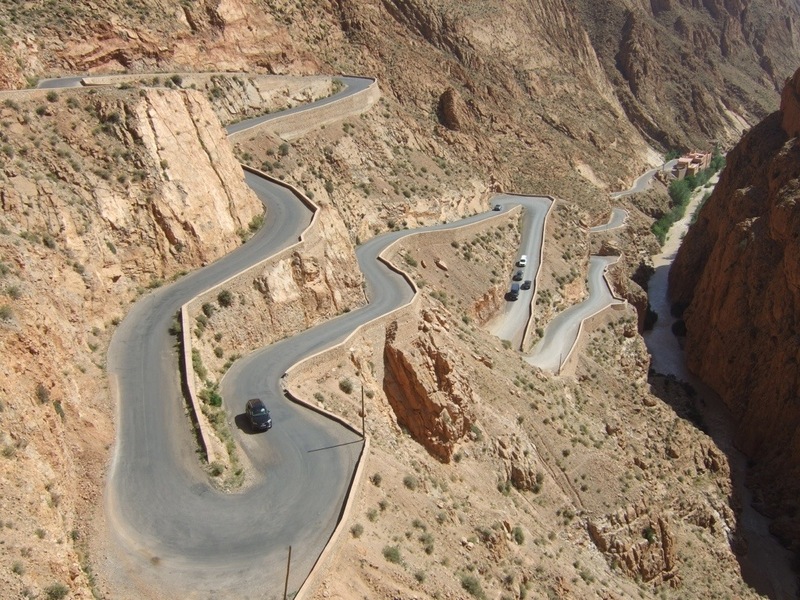 The days drive constituted of a 200 mile run from the coast south to near Meknes through the Rif mountains. The road was generally good, but not fast; equivalent in most parts to our B roads. The route took us through mountains, mountain passes with past flowing brown rivers and then into wide flat plains with wheat or corn growing. Everywhere there are donkeys, some feeding at the side of the road, others carrying huge loads. Everything here has to earn its keep. Also there are loads of Shepard’s some with just a handful of animals, others with loads; sheep, goats and cows are all herded around the countryside. Today our run took us through Meknes, Azrou and into the Cedar forests for the night. First stop, only a couple of miles from camp, was the Roman city of Volubilis dating back to the third century BC. 45 minutes was spent exploring through the ruins of the town searching out what appeared to be the temples, bath houses and homes. A huge Triumphal arch dominates the surroundings along with the remains of the Basilica. With the exception of a donkey shouting its head off, sorry not sure of the correct term, there was almost total silence which really helped to recreate the atmosphere of the place. It was almost possible to imagine the people going about there lives in what is an incredibly unspoilt and generally unchanged landscape. Next onto Azrou for shopping and lunch. Although we didn’t need provisions some fresh bread was purchased. Although not shops in the way we know them at home everything was available. One of the guys needed some gas – no problem. Another returned with two tubes of Pringles! Mike had rung ahead to book us into a cafe that they use regularly so we were all able to tuck into our choice of beef or chicken turine, or chicken skewers. The beef was wonderful! The parking at Azrou was limited and chaotic. However the Parking Guardian was on hand. This little old guy with his fluorescent orange tabard shouted and pointed until all 12 cars were safely parked. When it was time to leave he moved all double parked vehicles, stopped the traffic and saluted us on our way, all for the princely sum of 5 dirhams – about 35 pence. After lunch we experienced our first real off-roading following a rough trail up into the mountains and into the Cedar forest of the lower Atlas. The scenery was breathtaking, the driving excellent. Finally the evening was spent around a huge camp fire in the forest, watched over by a troop of about 200 wild monkeys. Another early start; I think most will be. Having packed and loaded we were off following the track through the forest and then on through the mountains. Amazing trails and tracks which took some driving in places. All got through without incident, but Phil then blew a tyre when we were “safely” back on Tarmac. The rest of the day was driving on through the mountains and then down slowly into the valley floor. Again the landscape changed completely with trees and greenery giving way to our first sight of desert. Not all sand dunes, but parched sandy, stony ground with less and less trees and shrubs. Every now and then an oasis would come into view in a complete contrast to the surroundings. At this point an oasis is much larger than generally imagined, more like a small farm with land given over to crops. A short break for coffee and provision collection in Zeida, a slightly longer one for lunch a little later and then it was tarmac up until the last mile or so of the days run. As we got closer to the overnight stop a message came across the radio about the sand storm up ahead. As we turned off the road Mike made the decision, after speaking to some Nomads, that we were to make camp at the pre-planned oasis. And so a mad dash across the sand, in worsening conditions, ensued. At the point of writing most people have parked up with as much shelter as possible and are sitting in their cars waiting for the storm to blow through. The only tents up are Scoobies roof tent – although I wouldn’t take bets on its survival – and Jo & Phil’s; as they have the two kids with them it was important that they got some shelter. The Nomads estimated the storm would blow through by 7pm. Only time will tell ….. The storm blew through last night with the worst of the wind, and therefore sand, dying down as predicted. As things eased I pitched my tent in an area nicely protected by several cars and had a great nights sleep. This morning we have woken to still air, the sun is up and the temperature is already beginning to rise. Today was all off-road through rough desert trails, soft sand and stony valley floors. It is clear to see where the rivers at times flow with great power, however there is no water and the ground is dusty dry. Apparently the flood waters flow down from the mountains at certain times of year with huge force. A river crossing we needed today was checked several times through the night to ensure that all was well. Because of where the flood waters start there is no easy way of predicting there arrival which must be terrifying at times for the locals with their delicate homes built right on the edge. Lunch was at an authentic oasis in the middle of the desert. Soft sand on the approach and palm trees to provide shade. Several times during the drive we saw individuals walking in the middle of nowhere. No houses, other people or animals in sight. It seemed they were just out for a stroll! One of the most impressive figures was a gentlemen dressed totally in blue – a Tuarge nomad. There were also wild camels to see along the way. A few minor dramas during the day; Bill busted a shock and dislocated a spring. Both fixed. Several punctures, it seems the Pete may be looking at 6 new tyres and another shattered rear window – Phil’s this time. After a long 8 hours behind the wheel we approached the Erg Chebbi dunes, mountains of soft golden sand that can be seen from miles away. At the foot of the dunes is the most welcome oasis of Auberge Du Sud. An amazing hotel in the form of a colonial fort. We had planned on camping, but were advised that as we were here for two nights a room would be a better option. Dinner in the hotel was a simple, but wonderful affair, after which an early night on a real bed. So tomorrow is a rest day. Due to the mechanical issues that need to be sorted there will be no driving, just a lazy day. Back on the road again Saturday. A few final points …. I wasn’t on a horse, with or without a name, but it was great to be out of the rain – and snow. Nothing to do but relax, catchup on the blog, emails, the news, etc. An easy start as wheels rolling was not until 9am, an hour later than usual. Breakfast in the auberge, pack and ready to go. It was really good to have two nights in a proper bed, real food and total relaxation. Now we are already to get back on the road. Well, there was a road for the first few miles which took us to Rissani for supplies and a coffee. From there is was more road, leading to tracks, leading to desert tracks and sand. The highlight of the drive today was a 30 mile full on dash across the sand. We were given a point to aim for, a gap in the mountains, and we were off; as fast or as slow as you liked. For me this started sensibly at a steady 20 to 30 miles and hour and then because the ground was flat and solid I put my foot down hitting a 65 mile an hour top speed; which on sand is probably a little too fast. Five or six of us set off, clouds of dust rising in our wake. Several dropped out leaving Bill in the lead, followed by Scooby and then me. Unfortunately about two thirds of the way across the ground changed to rough stone with steep sided ruts. I don’t know about my car, but both Bill and Scooby managed to get daylight under their tyres on more than one occasion, which is some going in a 110!! After a while the rough levelled and we were off again finally to be confronted by deep soft sand. Speed and momentum took us straight through, although there was a lot of sliding about to contend with. It wasn’t really a race, but Bill was 1st, I was second and Scooby third. Having calmed down after the exileration of the drive, probably the fastest since leaving Spain, we checked over the vehicles to ensure there was no damage. My car seems fine, however every storage box is broken! Tonight we are camping at Auberge Oasis Mharech which is somewhere between a dried up lake called Daya-el-Maider and a village called Oum-Jrane, very close to the Algerian boarder. For further information they have a website: www.elmharech.com. In times past this was a stop over for the Dakar Rally and is still used for similar events today. We left the Auberge at the regulation 8am on desert trails. In fact the whole day was spent driving rough, stony desert trails which are hard on car, drivers and passengers. It was hot, rough and tiring. Due to a mixture of heat, the road surface and vehicle usage, particularly heavy lorries, the track forms grooves approximately 2 inches wide with steep sharp ridges either side. These resemble corrugated sheeting and are horrendous to drive on. At lunch we stopped by a well in the middle of no where. There was a small clay hut no more than 4m x 5m in which lived three generations of the same family, 8 people in total. It would appear that a living was eked out tending goats and selling to tourists what ever could be made or bartering with anything that they were given. Several people on the trip who had been before left clothes, toys, etc., which they had brought with them from home. Only one mountain pass today with a steep climb followed by a sharp drop down into the valley beyond. For much of the track there was a shear drop down one side or the other with the edge only marked by a line of rocks. There were to security checkpoints during this stretch of the journey. At the first every passport was checked, vehicle and passengers recorded. At the second we were waved straight through – clearly too hot by this time to be bothered. 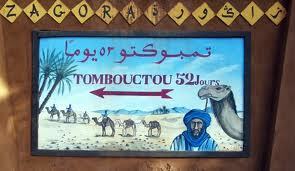 Our day ended In Zagora where we will be spending two nights in a hotel. This is where the rear screen on my car will be fixed at Ali’s Garage. What I didn’t expect, and wasn’t made at all clear, was the mandatory vehicle check. Funnily enough every vehicle needed something doing, although about half refused. My car needed a new part, in theory, but discussing it with the other guys on the trip the advise was to buy the spare and do it if needed as it was a simple enough job. The bit I really disliked, and will be taking up with the organisers on my return home, was the need to leave my car, fully loaded outside a back street garage in a Moroccan town over night! Fingers crossed all will be well. Tomorrow is a rest day while the vehicles are completed and then back on the road Tuesday. The day was spent looking round the town, lazing in the hotel and generally doing not very much. When we went into town late morning we took a walk to Ali’s garage to see how things were going. As my car only needed the glass changing, and he had shown me the part the previous day, I was expecting to see everything done and ready to pay for. Unfortunately it would appear that the part was wrong and a piece of plastic had been cut by someone with very poor eyesight! It looked as if an entire tube of mastic had been used to file the holes. I mentioned to Tom that I wasn’t happy and he said they had already spoken to Ali. At that I left. We had been told that all cars would be ready for collection at 5. Unfortunately when we got back neither my car or Phil’s, which also needed a new window, were at the garage. 45 minutes later they turned up with new plastic windows. As the agreed price was for glass we both saved ourselves 300 Dhm. The final little twist of annoyance was that having got back to the hotel we both noticed that the rear break light which sticks to the glass was missing. This was the last straw for Phil who returned to Ali’s, got him back to the workshop and collected our lights. It would appear that they had been safely stored ready for the next car that needed one. It is safe to say that the whole Ali’s garage experience was not a high point of the trip. Mountains : Tuesday 9th April. Today’s journey consisted of tarmac and then onto a stunning mountain trail which took us 8000 ft. into the Black Mountains. The views were truly breathtaking especially as we drove through the moonscape of gravel, stone and down into a forgotten valley full of palm trees and small communities. It is safe to say that my words will not be sufficient to describe the seen so I have added a few pictures. 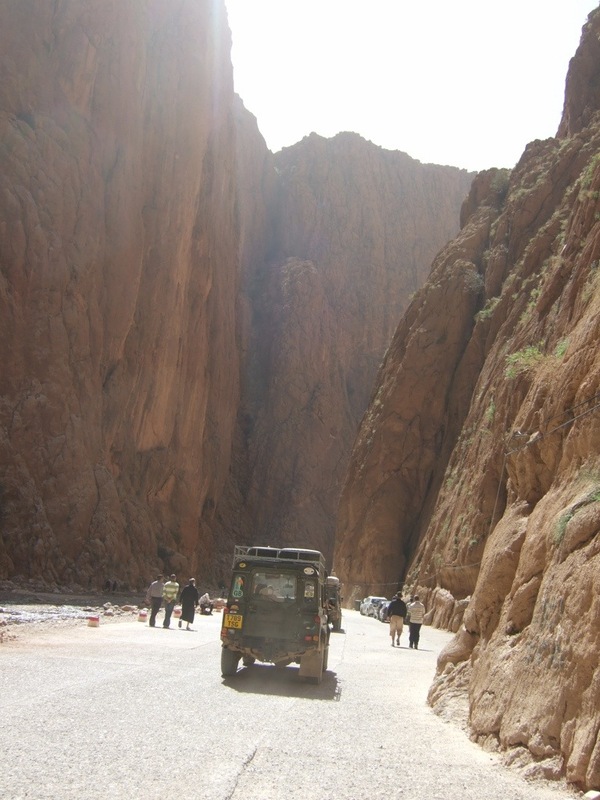 Finally the journey ended by travelling through the Todra Gorge just north of Tineghir. This colossal gorge would dwarf anything to be found back home. As you drive through you can see the caves dotted about in the cliff walls; sometimes you see movement and can spot those that are still occupied. Today should have been our last full day of off-roading taking us up through mountain passes at a hight not yet reached. Unfortunately this was not to be; the road was closed due to heavy snow! 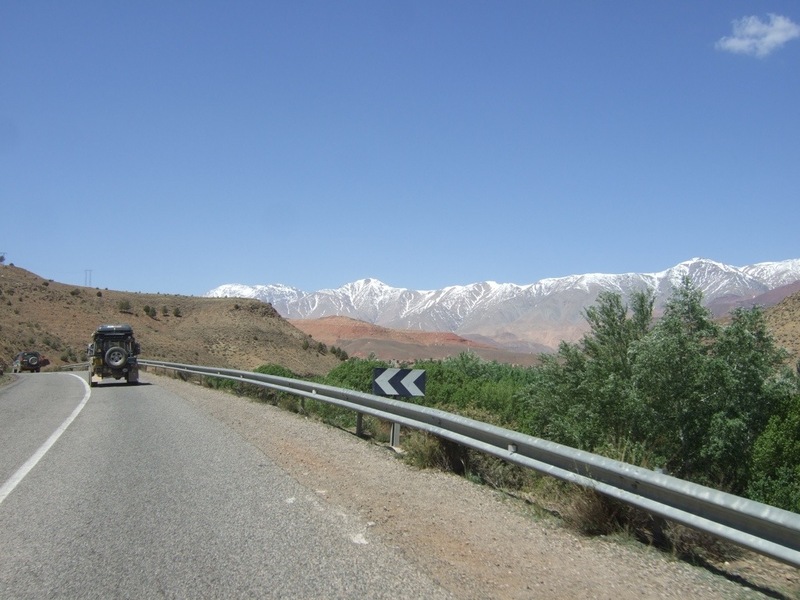 Although very difficult to believe while enjoying 25 to 30 degree heat, snow had made the highest mountain roads impassable by any vehicles and therefore they had been shut off by the authorities. As they would be challenging in good conditions an alternative route for the day was required. We travelled back down through the Todra Gorge and stopped to spend half an hour admiring the breath taking views, looking up to the sky through the slit in the shear rock walls. 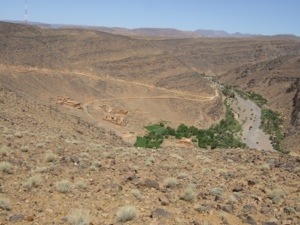 Then it was on, via tarmac, to Boumaine-ed-Dades and up through the Dades Gorge. The highlight of this section was the switch-back road climbing out off the gorge floor. Leaving Boumaine-ed-Dades we headed south west to Quarzazate before heading on to Marrakech. 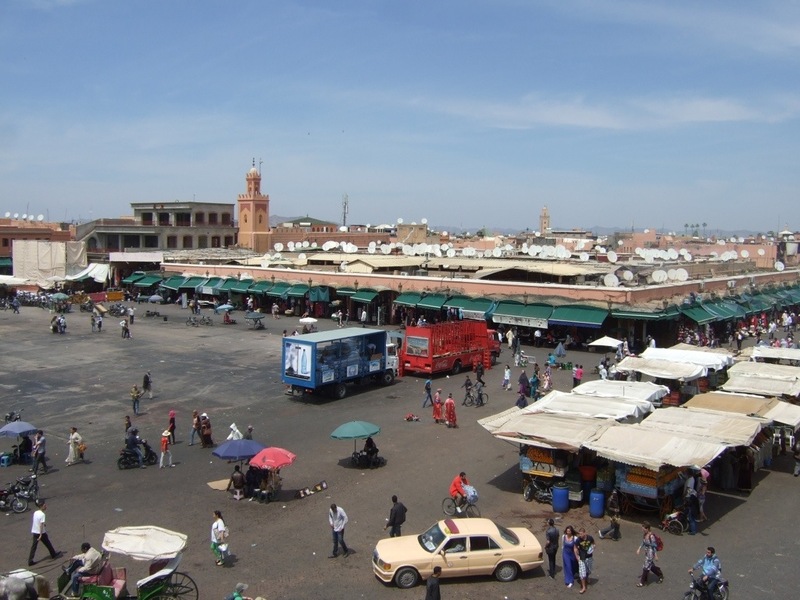 Quarzazate is famous as the centre for the Moroccan film industry with its small airport having played hosts to the likes of Brad Pitt and Angelina Jolie. As you pass by the studios on the outskirts of the town you can see the sets for such films as The Mummy, Gladiator and Troy. A little further on we passed a sign post for Ait-Benhaddou where the Tafas massacre in David Lean’s film Lawrence of Arabia was shot, using Moroccan army troops to play the Turkish army. Past Quarzazate we headed up through the High Atlas by way of the pass at Tizi-n-Tichka, almost 7000ft above sea level. Although warm and clear for us you got a glimpse of the conditions experienced in the winter with the snow covered peaks in the distance, the barriers to close the roads, the snow poles to mark the edge of the roads and indicate the depth of the laying snow and finally the snow ploughs parked up in a small town on the edge of the pass ready to be brought into service when required. Our journey ended for the day at the hotel in the Imperial City of Marrakesh. After checking in to the hotel, and a short rest, we walked into the main square for our first experience of the city. As you approached the noise level and the mass of humanity increased. The sights, sounds and smells were intense and combined to assault your senses….. but what an amazing experience. There was everything from horse draw carriages, to snake charmers and traditional musicians. We eat in a small cafe which provided views over the square so that we could observe from a distance, before getting back in to the thick of it tomorrow. The Imperial City of Marrakech was everything I expected and more. The hustle and noise of the night before had given way to slightly more ordered chaos as we entered the walled city at about 10am. 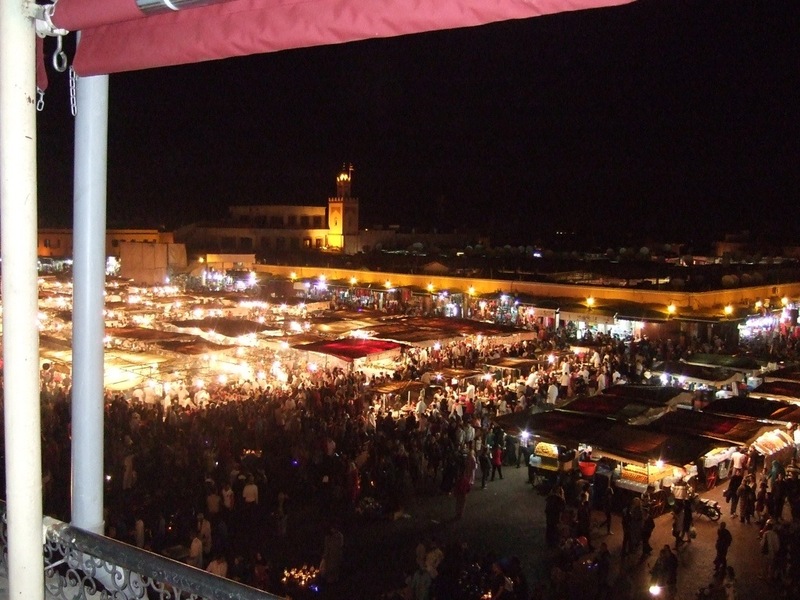 There is so much to see within the walls that one day at the end of a tiring two week trip was never going to be enough and so we decided to concentrate on the Souks which are positioned to the north of Place Jemaa el-Fna, the main square. Although referred to in the plural, the different sections, which are each dedicated to their own produce, blend into a single labyrinth of passageways, shops, workshops and homes. As you enter into the Souk you are met by all manner of goods displayed from floor to ceiling and stretching back into the depths of the shop. Shops merge one into another with a vivid collection of colours. The passageway we entered started with handmade shoes and slippers leading on to clothes and cloth, then into leather goods and so on the further you progressed into the depths. In some places the shops were over three levels with small staircases linking the floors. Every now and then there would be a passageway with no shops, but simply a number of doors. These would appear to be the entrance to some of the homes which existed within the overall structure. 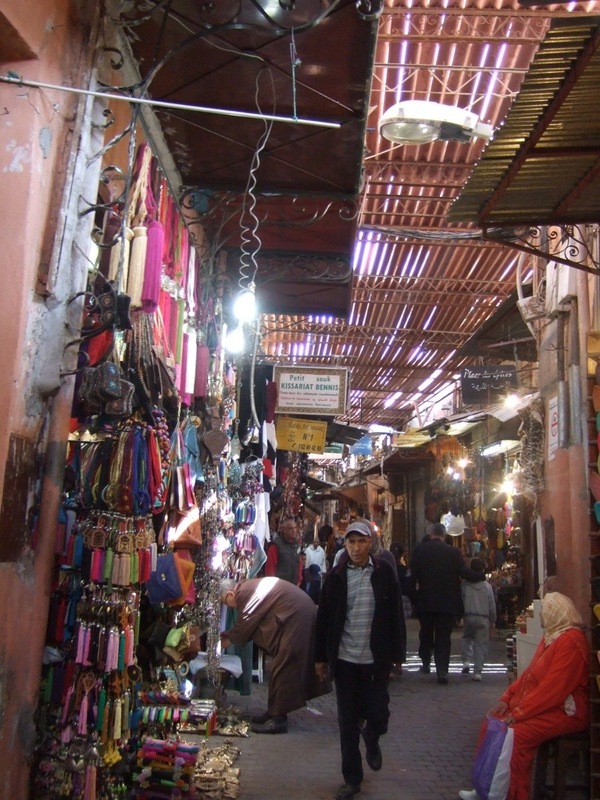 Further into the Souk workshops became evident between shops and, again, down little alleyways. Occasionally you would see an elaborate doorway which was the entrance to a grand hotel or restaurant. Unless the door was open there was no sign of what was inside; no windows were visible simply the doorway. The use, size and complexity of the building beyond would only be revealed once you stepped over the threshold. In a couple of places we came across the entrance to a mosque. As you progressed deeper the colourful shops slowly gave way to the more practical ones selling the items that the occupants needed for everyday living. 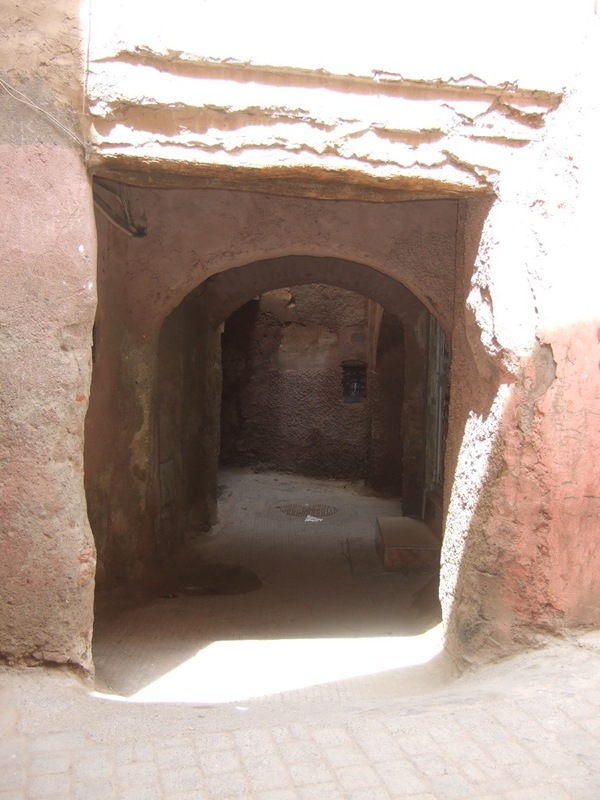 It was easy to image some occupants of the Souks spending their entire lives within these alleyways. Never leaving to see daylight. There were many things that left a mark on the memory …. The sights and smells. The smiles on the shopkeepers faces and the “good price” everyone offered, even though we all knew the “good price” was only the start of the negotiations. And also the comments, “lovely jubley” must have been said a dozen or more times. When asked if we were heading in the right direction one shop keeper returned, with a big smile, “that’s the way to the square, this is the way to my shop …”. Marrakech is with out doubt a city to revisit. Although the experience of the Souks may not have quite the same impact second time round there are are many other things to see. As I said, one day was never going to be enough …. A long, hot, days driving today took us from the magnificence of Marrakech past Casablanca and Rabat to the small Atlantic coast town of Moulay Bousselham ready for the short run up to the port at Tangiers tomorrow. Generally there was nothing of great note about this drive. It was predominantly motorway, or at least the Moroccan equivalent. There were times when the locals driving skills beggared belief but we all arrived at our final destination safely. On arrival in Moulay Bousselham huge crowds of people had gathered having some form of festival. When we went to investigate it turned out to be a form of horse racing where groups of riders charged down a stretch of dirt ground about 400 m long. Before hitting the barriers at the end they pulled up their horses and fired their guns. Although there was some logic to the proceedings it beat us, but the spectacle was amazing. 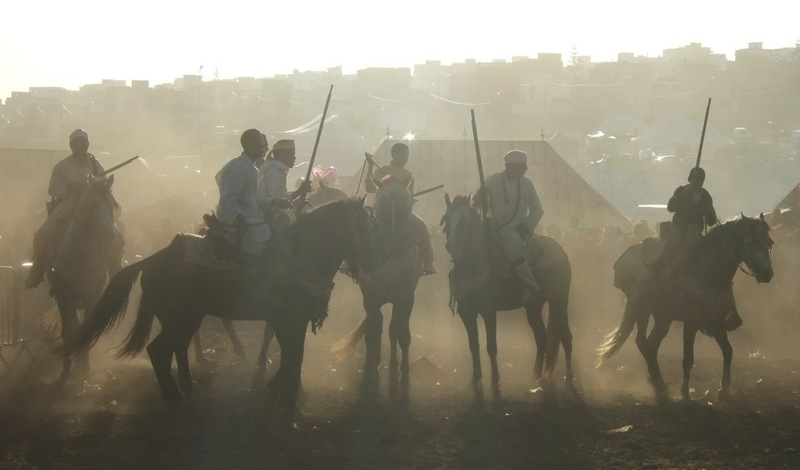 All the riders and horses were dressed in traditional costume and the guns, which were also of a traditional design, made an incredible noise. All this coupled with the dust and smoke made for quite a spectical. Tomorrow is our last day in Morocco. Wheels rolling is at 7am so that we can try and make the 10.30 ferry. Fingers crossed all goes to plan. Up at 6 and on the road as planned at 7, we made the port of Tangier Med in plenty of time. 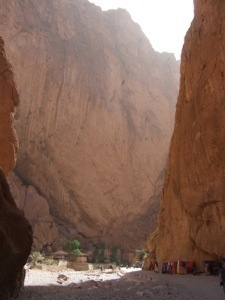 Unlike the way into Morocco the way out was very ordered with very few people. This certainly wasn’t a route used by the general population. Unfortunately the 10.30 ferry was cancelled; the 12:30 ferry turned up at about 1 o’clock! Getting on to the ferry and the crossing itself were generally fine even with the considerable delays, however leaving the ferry was a nightmare. It would appear that three ferris had turned up at once which caused complete gridlock in the port.